South Africa puts itself on the map for a handful of activities, and nowdays, golfing is one of them! Check out these top three extreme golf courses in South Africa. One is extremely wild, another is extremely long and the other is extremely beautiful. Extreme golf as it should be: awesome! Perched on the border of the Kruger National Park, this par-72 Hans Merensky golf course is surrounded by wildlife. Encounters with elephants, giraffes, or zebras are to be expected while making your way around the course. That’s wild. The first 18 holes of this 19 hole golf course wins this golf course the title of the longest golf course in South Africa. The additional hole is just a little added extra to ensure that this epic golfing experience ends of with a touch of the extreme. Extreme golfing. A par-3 course, however, golfers need to take a helicopter flight to reach the tee, which happens to be 1,410 vertical feet high. But what is the point of launching a golf ball off of the edge of a cliff with zero chance of knowing if you actually reached the ‘Africa’ shaped green at the bottom? There would be no point, that’s why with tracking equipment and four video cameras, the flight of the golfer’s ball is tracked. Awesome. The Cape Winelands are a stretch of lush landscapes perfect for wining, dining… and golfing. 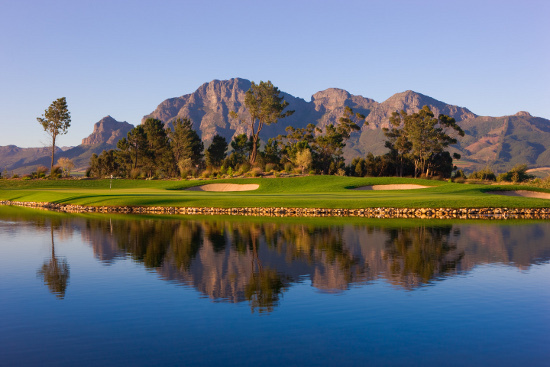 Nestled in stunning surrounds the Cape Winelands offers simply exquisite luxury golf holidays. Brilliant golf architects have utilised the beauty of the rolling vineyards and bold Helderberg Mountain range to create stunning courses. A truly tranquil golfing experience.